PopLyfe is leading the next generation of gifted musicians and artists emerging from the San Francisco Bay Area. PopLyfe is ready to carry on the Bay Area’s history of delivering new styles of music and artistry to the entertainment industry. Currently attending TSM (Tony’s School of Music), they are learning the business of music from a host of mentors including legendary guitarist and Grammy Award winning producer D’Wayne Wiggins of Tony Toni Tone. 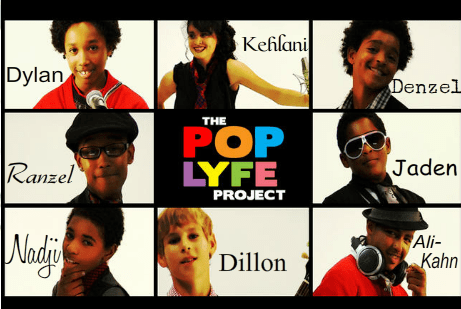 Following in the footsteps of Destiny’s Child and Keyshia Cole, PopLyfe is the latest project under development by TSM. Already being recognized as the “Lil Tony’s,” PopLyfe’s style ranges from Classical and Jazz to R&B and Hip Hop. PopLyfe has played live across the Bay Area and beyond with performances at The Universal Gibson Amphitheater with Bobby Brown, Paramount Theater with Guy and Tony Toni Tone and opening for Artist Trey Songs at SF Mezzanine. “The PopLyfe Project,” a reality TV show following the development of the group is currently in production. Watch out for the TV show spotlighting these artists from the Bay Area.